Fresh strawberries and bananas, plus luscious custard filling, make this pie an all time favorite dessert. 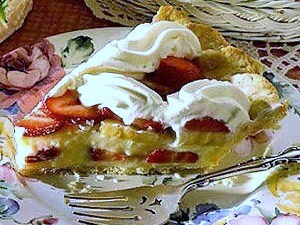 Here is an easy dessert recipe for Strawberry Banana Cream Pie. Prepare pie crust; set aside to cool. To make the filling, combine sugar, cornstarch and salt in medium saucepan. In a bowl, blend together egg yolks and milk. Stir small amount of milk mixture into dry ingredients, making a smooth paste. Gradually blend in remaining milk mixture. Cook over medium heat, stirring constantly, until mixture thickens and boils. Boil, stirring constantly, 1 minute. Remove from heat. Stir in vanilla. Cool quickly by setting pan in bowl of ice or cold water and stirring for a few minutes. Set aside about 1/4 cup strawberry slices for garnish. Arrange remaining strawberry slices in pie shell. Pour half of the custard mixture over strawberries. Top with banana slices. Cover with remaining custard mixture. Cover and refrigerate until thoroughly chilled.